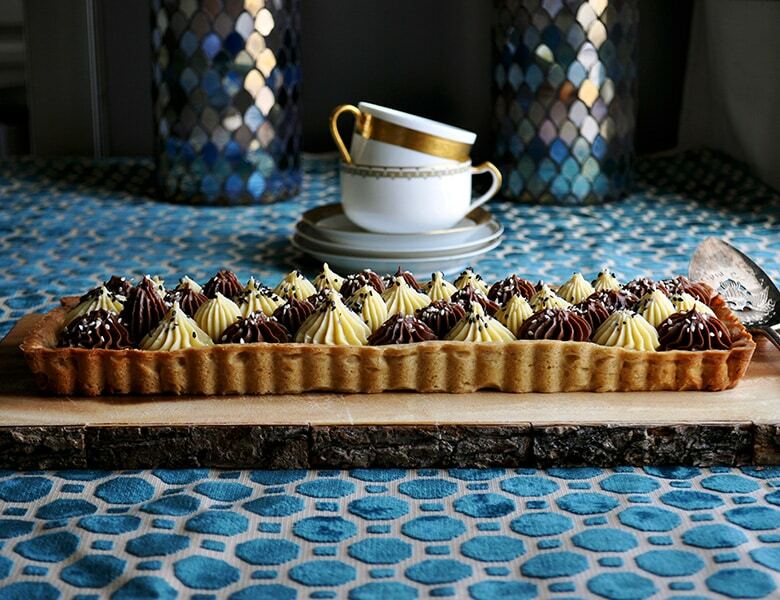 Dark and white chocolate pastry cream is flavored with the nutty deliciousness of tahini before being pipped into a classic, crispy tart shell that’s warmed with the flavors of cinnamon, nutmeg, allspice, and cloves. I’m a little bit obsessed with tahini right now. 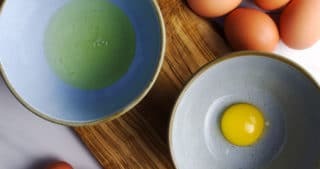 For those of you who like to cook with me over at A Little and A Lot, you’re going to see tahini pop up in several spring dishes – in salad dressing and hummus, sauced over chicken and seafood, and maybe a noodle dish or two. 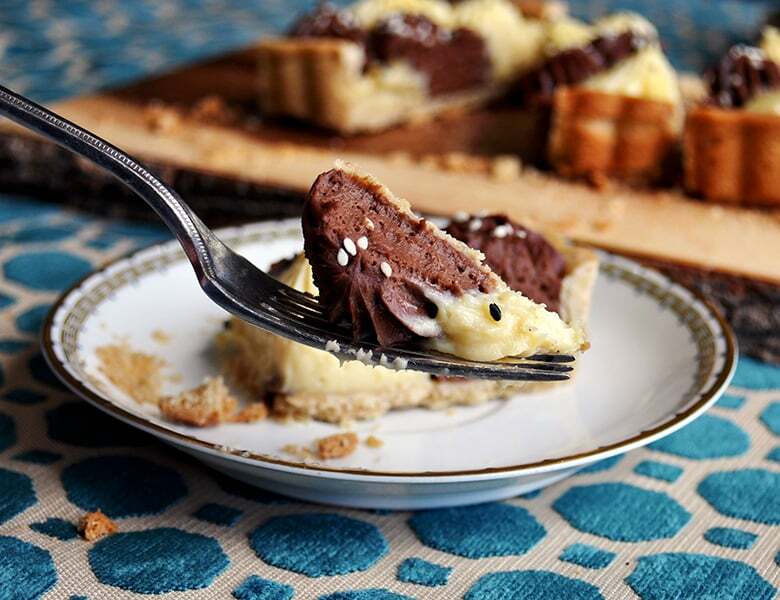 Over here, where we’re more interested in baked goods and desserts, tahini has found it’s way into this mysteriously delicious, richly elegant, black and white chocolate tart. If you’re not familiar with tahini, it’s nothing more than ground sesame seeds, which is not such a strange thing to add to sweet treats. Any internet search will turn up recipes for sesame seed candy, cookies, and cake, for good reason. 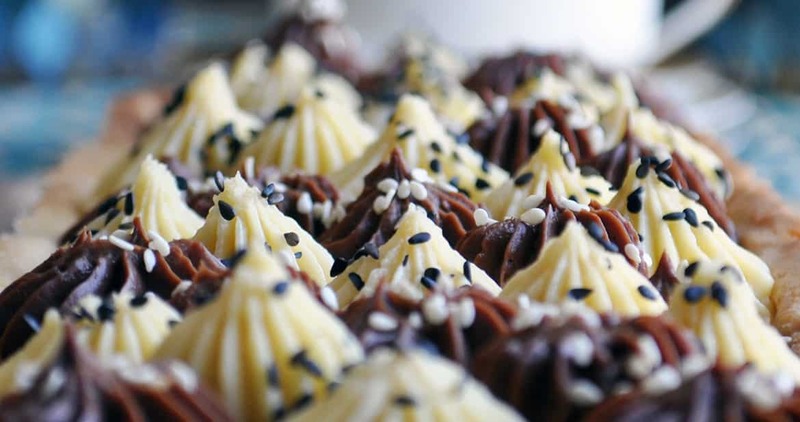 They add a unique nuttiness to baked goods that’s more subtle than other nuts and seeds, and slightly on the sweet side. If you can’t find it at your local market, you can order tahini on Amazon, or even make a batch of homemade tahini by simply grinding up some toasted sesame seeds. 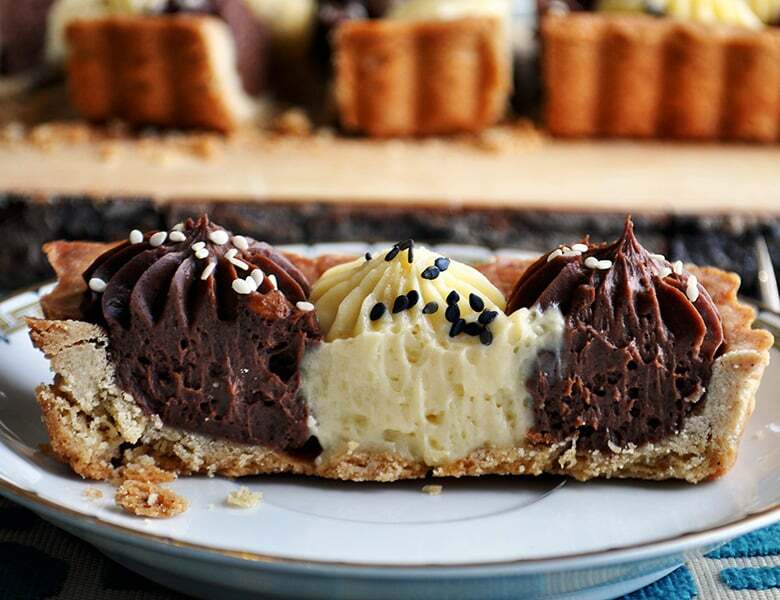 In this dark and white chocolate tart, a bit of tahini is whipped into both dark chocolate and white chocolate pastry cream. Serve it up and watch people’s faces as they slowly savor each bite, trying to identify the mysterious flavor playing a supporting role to all that rich, creamy chocolate. Don’t be deceived by the length of directions. 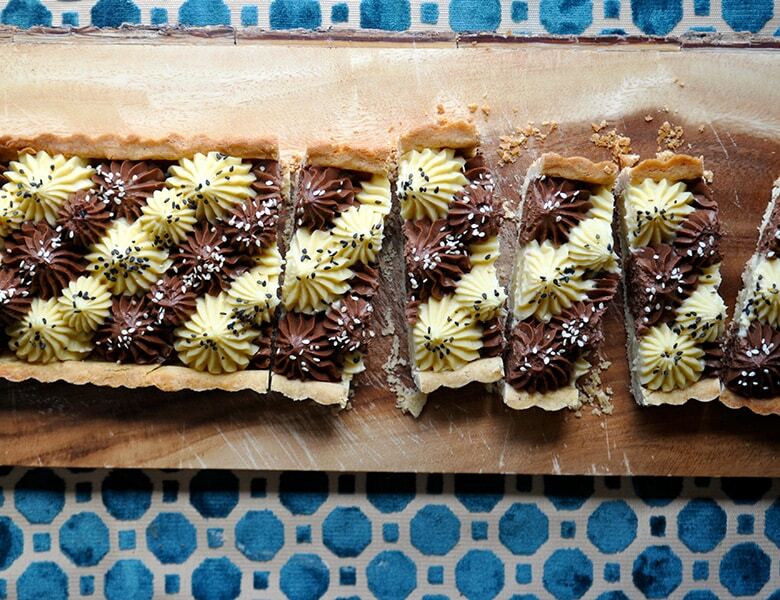 This is a super simple chocolate tart. 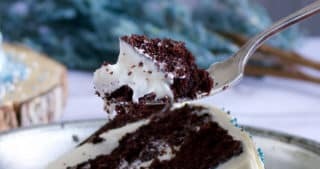 Glancing at the length of directions, you will be tempted to assume that this is a complicated and time consuming dessert to bake. Nothing could be further from the truth. 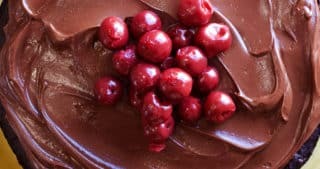 You’ll start with one recipe of my favorite pastry cream, then simply divide it in half, adding white chocolate to one and dark chocolate to the other. After it cools, beat in some whipped cream and tahini and the filling is done. The tart dough comes together in just a few minutes in the food processor. Then it’s simply a matter of chilling the dough, rolling it out, and baking it up. 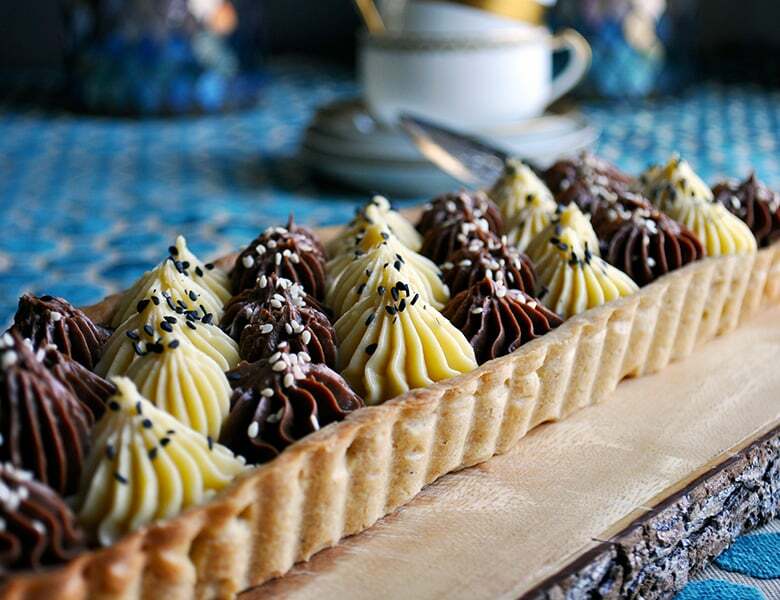 Once the pastry shell is cool, pipe the white and dark chocolate pastry creams into the shell in whatever pattern strikes your fancy. If you don’t want to pipe it, spread one of the chocolate pastry creams across the bottom of the tart shell and the other across the top. You’ll be rewarded with an elegant looking dessert that looks considerably more complicated than it actually is. But, you’re the only one who has to know that. Use either a rectangle or 9-inch round tart pan with a removable bottom. The shape of the pan doesn’t matter, but having a removable bottom is essential to getting the pasty crust out of the pan without breaking it. Add the dark chocolate to a medium bowl and the white chocolate to another. Set aside. 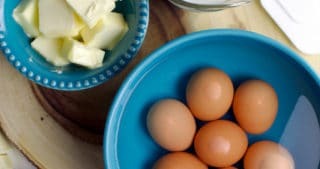 Add milk, sugar, salt, egg yolks and cornstarch to a 4-quart or larger heavy bottomed saucepan and whisk vigorously to combine. Bring to a boil over medium-low heat, whisking constantly, at which point the mixture will have thickened to the point that the whisk will leave tracks as you stir. Remove from the heat and whisk vigorously for 30 seconds longer. Pour half the pastry cream over the dark chocolate and the other half over the white chocolate. Using your fingers, break the gelatin into small pieces and drop half the pieces into one bowl of pastry cream and the other half into the other. Let sit for 5 minutes to melt the chocolate. Add 1 tsp vanilla to each bowl, then stir until all the chocolate is melted and incorporated along with the vanilla and gelatin. Remove both bowls of pastry cream from the refrigerator. 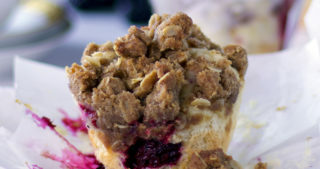 Using an electric mixer, beat 3/4 cup whipping cream until stiff peaks form. 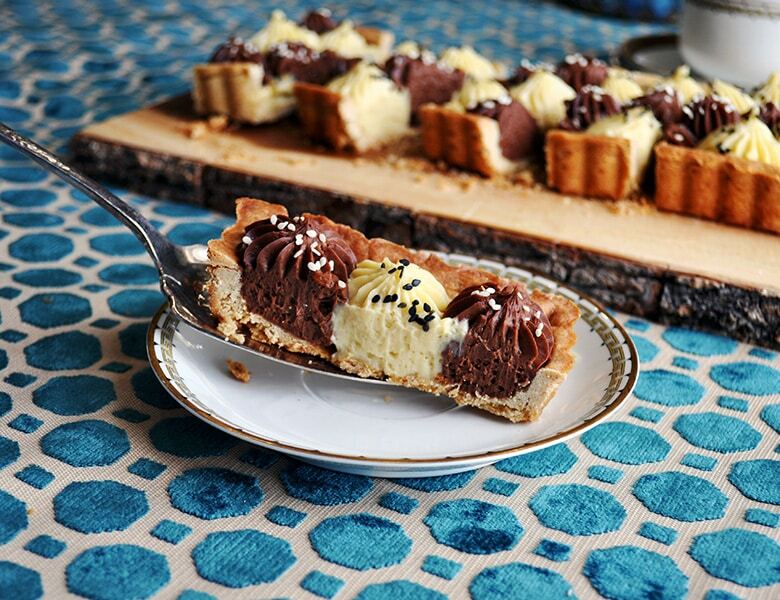 Scoop half the whipped cream into the bowl of dark chocolate pastry cream. Scrape the white chocolate pastry cream into the bowl of the electric mixer along with the remaining whipped cream. Add 1/4 cup tahini and beat the white chocolate pastry cream, whipped cream, and tahini at medium speed for about 1 minute, until everything is incorporated and the pastry cream is smooth. Scrape the white chocolate tahini pastry cream back into the original bowl. Add the dark chocolate pastry cream and whipped cream into the bowl of the electric mixer. Add 1 tbsp tahini and beat the pastry cream, whipped cream, and tahini at medium speed for about 1 minute, until everything is incorporated and the pastry cream is smooth. Add the egg yolks,1 tbsp whipping cream, and vanilla to a small bowl and whisk to combine. Add the flour, cinnamon, nutmeg, allspice, cloves, salt, and powdered sugar to the bowl of a food processor. Pulse a couple of times to combine. Add the pieces of butter to the flour mixture and pulse until the mixture resembles coarse cornmeal – about 10 pulses. With the machine running, pour the egg mixture through the feed tube and process just until the dough begins to stick together, about 8-10 seconds. Be careful not to overprocess. Turn the dough out onto a large sheet of plastic wrap and knead 2 or 3 times to bring the dough completely together. Flatten the dough into a 6-inch disk, wrap tightly in the plastic wrap and refrigerate for at least 1 hour and up to 24 hours. After chilling, unwrap the dough and lay it on a lightly floured work surface. 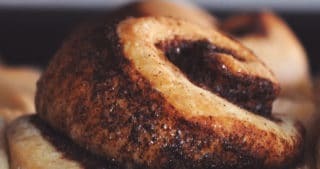 (If the dough has been in the refrigerator for longer than 1 hour, you might need to let it sit at room temperature, covered, for 10 minutes or so to allow it to soften up a bit.) 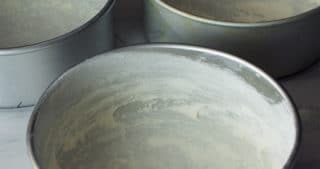 If using a 9-inch round pan, roll the dough into an 11-inch circle. If using a rectangle pan, roll the dough into a rectangle that’s at least 20-inches long and 10 or 11-inches wide. Use flour to keep the dough from sticking to your work surface or rolling pin as you roll it out. It can also be helpful to have a large spatula handy, to slide under the dough from time to time to keep it from sticking to your work surface. Gently wrap the dough around your rolling pin and then unroll over your tart pan. Lifting the edge of the dough, gently ease the dough into the pan. Press the dough against the sides of the pan and into the corners, wrapping the edges of the dough up and over the sides of the pan. Roll the rolling pin over the top of the tart pan to cut any excess, overhanging dough from the pan and create a clean edge. If any of the dough inside the pan is too thin or torn, use pieces of excess dough to reinforce and repair. Cover the dough with plastic wrap and put in the freezer for 30 minutes. Remove the dough from the freezer and line with a double layer of aluminum foil. Fill with pie weights or dried beans and bake for 30 minutes. Remove the foil and pie weights or beans. Return to the oven and bake 5-10 minutes longer, until the shell is fully baked and golden brown. Remove from the oven to a wire rack and allow to cool completely in the pan before proceeding. Fit two pastry bags with large open star decorator tips. 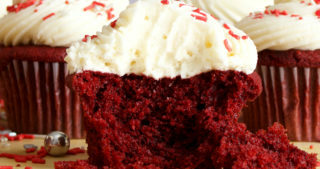 (cupcake tips). Fill one bag with the white chocolate tahini pastry cream and the other bag with the dark chocolate tahini pastry cream. Remove the sides of the tart pan and use the tip of a sharp knife to gently separate the bottom of the tart pan from the pastry shell. Place the shell on a serving platter. 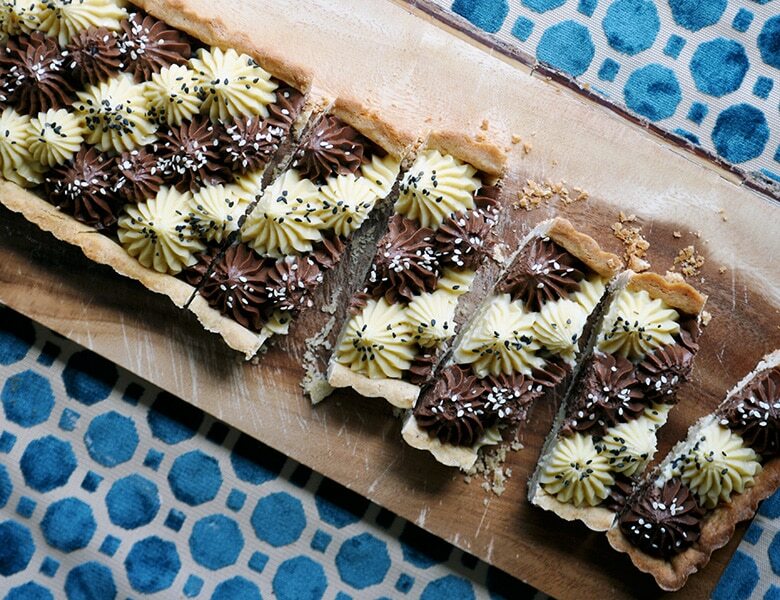 Squeeze generous “stars” of pastry cream into the tart shell in any pattern you like. 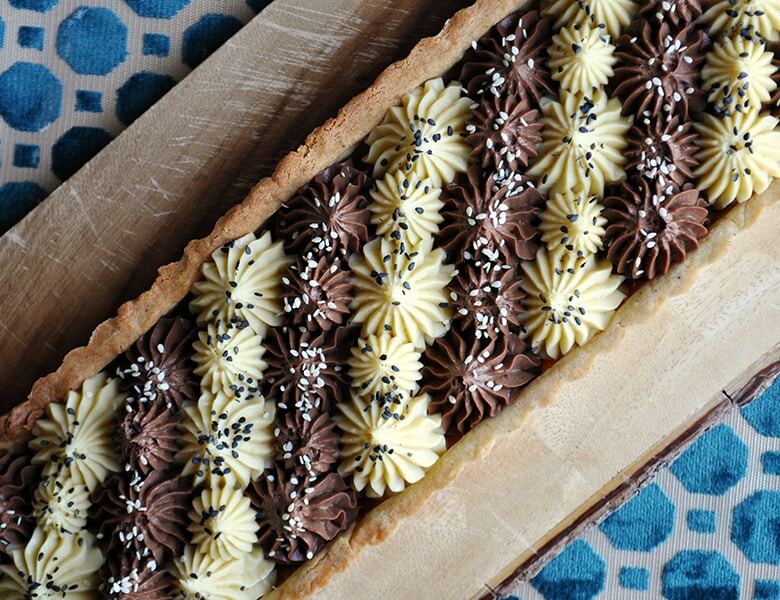 Sprinkle the top of the pasty cream with white and black sesame seeds to decorate, if desired. Cover and refrigerate the tart until ready to serve, up to 24 hours.